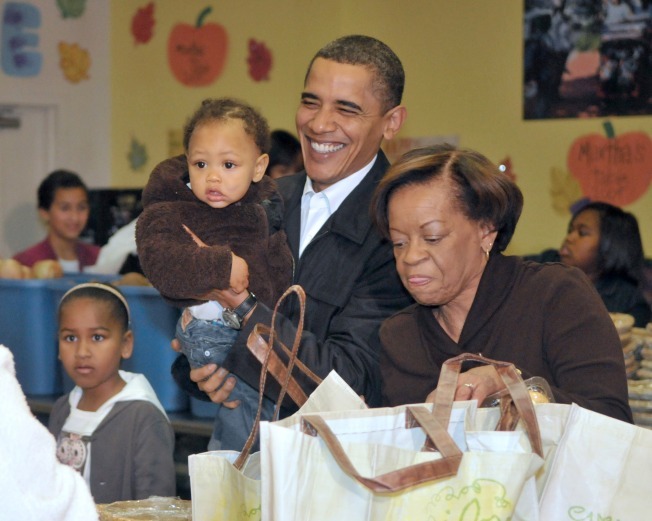 The Obama family passed out turkeys, stuffing and other Thanksgiving favorites to people at a food pantry organization. President Barack Obama tucked pumpkin pies into people's bags at Martha's Table in downtown Washington on Wednesday evening and wished them a happy holiday. Obama's two daughters, first lady Michelle Obama and her mother, Marian Robinson, worked alongside the president, putting canned food, stuffing and fresh vegetables into bags. Those in line also received frozen turkeys. Children who attend educational services at the organization designed some of the bags.